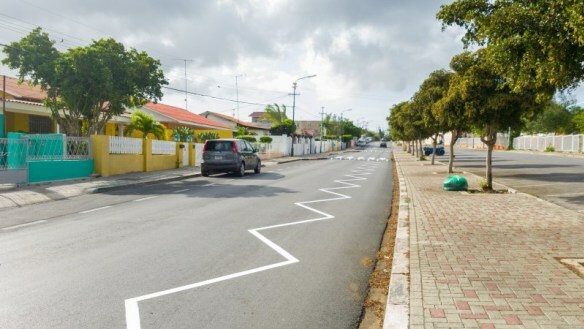 WILLEMSTAD - On the Grebbelinieweg (road), motorists are warned with zigzag lines that they are approaching a zebra crossing or a dangerous crossroads and have to reduce their speed. The lines have been laid out by the Ministry of Transport, Transport and Urban Planning (VVRP). Pedestrians are also part of the traffic, they have to be able to use the road in a safe manner. That is why the ministry has put the lines on the Grebbelinieweg. This is the first but the ministry will continue with this new warning sign in other parts of the island. On the photo a part of the Grebbelinieweg with the newly applied lines.